Our nation's biggest banks have had a tough 2018. Wall Street analysts recommended bank stocks given the benefit of rate hikes by the Federal Reserve. This strategy failed, as I warned back in the first quarter. My theme has been that as the Fed unwinds its balance sheet, money gets drained from the banking system, which hurts bank liquidity. To bail out the banking system from the "Great Credit Crunch" the Federal Reserve cut the federal funds rate to 0.00% - 0,25% on Dec. 16, 2008 and kept it there until Dec. 16, 2015. During this time horizon the Federal Reserve also increased its balance sheet through bond buying programs called quantitative easing. During quantitative easing, the Federal Reserve printed money and bought U.S. Treasuries and Federal Agency securities including mortgage-backed bonds. Funds flowed into the banking system designed to increase lending. The Fed balance sheet, which is basically a portfolio of these securities, ballooned from just under $1.0 trillion to $4.5 trillion as of September 2017. So far, the rate hikes have raised the federal funds rate to 2.00% - 2.25% with another rate hike likely this month. I predict that 2019 will see a rate hike in June and another in December taking the funds rate to a "normal" 2.75% - 3.00%. The Federal Reserve began to unwind its balance sheet in October 2017 at $10 billion a month for the fourth quarter 2017. The balance sheet had been at $4.5 trillion since December 2014. In 2018, the balance sheet drain began the year at $20 billion per month for the first quarter then to $30 billion per month in the second quarter then to $40 per month in the third quarter. Beginning in October 2018, the pace of the unwinding was upped to $50 billion per month, which could last through 2020. What the Fed does is, when a security in the portfolio matures,it does not re-invest the principal or interest, thus allowing the balance sheet to drain. This is money no longer in the banking system hurting the liquidity of the bigger banks. Banks began to feel this drain in the first quarter when eight of the nine big banks I profile today set their all-time or 2018 highs. Banks have thus been in a liquidity squeeze that intensified as the monthly drain reached $50 billion per month in October. This also lines up with the all-time intraday high for the Dow Jones Industrial Average, which peaked at 26,951.81 on Oct. 3. 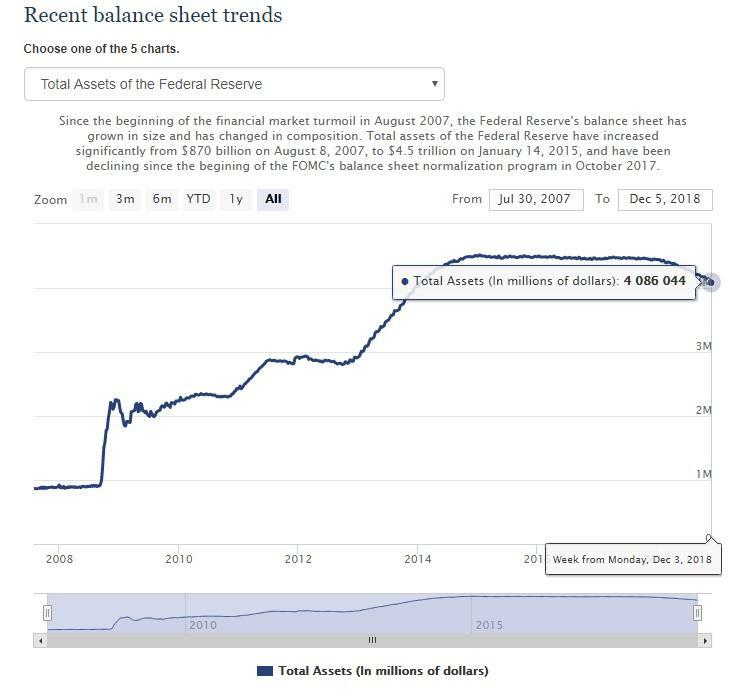 As of Dec. 5, the Fed Balance sheet (or bond portfolio) totaled $4.086 trillion down $414 billion since the end of September 2007. This is a drain from the banking system that is bearish for big banks. The Fed is scheduled to drain $50 billion this month and another $1.2 trillion in 2019 through 2020 ($50 billion x 24 months). Three of the four "too big to fail" money center banks have fallen into bear market territory, the other is in correction territory. Three of the five super regional banks I follow are in bear market territory, the other two are in correction territory. Bank of America (BAC - Get Report) set its 2018 high of $33.05 on March 12 and set its 2018 low of $24.29 on Dec. 10. The stock is in bear market territory with a negative weekly chart and its 200-week simple moving average or "reversion to the mean" at $21.74. My annual value level is $20.93 with monthly and semiannual risky levels at $28.39 and $28.47, respectively. Citigroup (C - Get Report) set its 2018 high of $80.70 on Jan. 29 and set its 2018 low of $55.83 on Dec. 10. The stock is in bear market territory with a negative but oversold weekly chart. The stock has fallen below its 200-week simple moving average or "reversion to the mean" at $59.00. The stock is below my monthly risky level at $68.45. JP Morgan (JPM - Get Report) set its 2018 high of $119.33 on Feb. 27 and set its 2018 low of $99.28 on Dec. 10. The stock is in correction territory with a negative weekly chart and its 200-week simple moving average or "reversion to the mean" at $83.67. My annual value level is $93.20 with my semiannual and monthly risky levels at $109.39 and $110.87, respectively. Wells Fargo (WFC - Get Report) set its 2018 high of $66.31 on Jan. 29 and set its 2018 low of $48.30 on Dec. 10. The stock is in bear market territory and its weekly chart is negative with the stock below its 200-week simple moving average or "reversion to the mean" at $53.58 on Oct. 24. The stock is below my monthly and semiannual risky levels at $56.81 and $57.40, respectively. BB&T Corp (BBT - Get Report) set its 2018 high of $56.31 on March 12 and set its 2018 low of $45.93 on Oct. 12. The stock is in correction territory and its weekly chart is negative with the stock above its 200-week simple moving average or "reversion to the mean" at $43.43. The stock is below my semiannual and monthly risky levels at $48.47 and $49.76, respectively. M&T Bank (MTB - Get Report) set its 2018 high of $197.37 on Feb. 27 and set its 2018 low of $153.15 on Dec. 10. The stock is in bear market territory and its weekly chart is negative with the stock above its 200-week simple moving average or "reversion to the mean" at $145.22. The stock is below my monthly and semiannual risky levels at $158.52 and $169.20, respectively. PNC Financial (PNC - Get Report) set its 2018 high of $162.58 on Feb. 27 and set its 2018 low of $116.55 on Oct. 24. The stock is in bear market territory and its weekly chart is negative with the stock above its 200-week simple moving average or "reversion to the mean" at $114.12. The stock is below my monthly, annual and semiannual risky levels at $126.26, $135.29 and $137.59, respectively. SunTrust (STI - Get Report) set its 2018 high of $73.44 on July 24 and set its 2018 low of $54.75 on Dec. 10. The stock is in bear market territory and its weekly chart is negative but oversold with the stock above its 200-week simple moving average or "reversion to the mean" at $52.65. The stock is below my monthly, annual and semiannual risky levels at $65.47, $64.41 and $65.95, respectively. U.S. Bancorp (USB - Get Report) set its 2018 high of $58.50 on Jan. 29 and set its 2018 low of $48.49 on May 29. The stock is in correction territory and its weekly chart is negative, with the stock above its 200-week simple moving average or "reversion to the mean" at $48.05. The stock is below my monthly and annual risky levels at $54.30 and $60.27, respectively, with my semiannual pivot of $51.85.